Procter & Gamble Co. is coming clean about the history behind Ivory soap, saying the product's ability to float wasn't discovered by accident. The company has used the slogan "It floats" to promote Ivory since the 1800s. The earliest P&G advertising also emphasized Ivory's buoyancy, along with the long-standing claim that the bar soap is "99 and 44/100ths percent pure." Although the Cincinnati-based company acknowledged that the soap floats because P&G whips air into it, it long has attributed that to a production mistake. But an 1863 notebook entry by P&G chemist James N. Gamble may set the record straight, according to Ed Rider, the company archivist who found the document. "I made floating soap today," Gamble wrote. "I think we'll make all of our stock that way." Gamble, son of P&G co-founder James Gamble, had previously studied with another chemist who already knew how to make soap float, Rider discovered. The company is disclosing the new information in a book on the history of P&G, the consumer products giant also known for Tide detergent and Crest toothpaste. The book, called "Rising Tide," is due in stores July 8, Rider said. 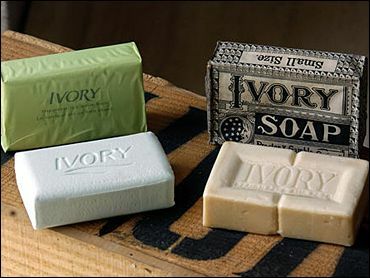 Ivory, which is celebrating its 125th anniversary, became the first blockbuster brand for P&G, a soap and candle company established in 1837.